For the Adler hotel we show actual room availability. The room prices and last minute discounts shown on OrangeSmile.com are also actual and final. Description: This refined hotel is located in the Salamanca section of Madrid, between Velázquez and Goya, two of the most renowned streets of the city. The hotel occupies a villa dating from 1884 and has been enhanced to offer contemporary amenities without losing its classical 18th century magnetism. The large, refined and pleasant rooms were decorated by an acclaimed designer and are one of the best examples of Renaissance classicism. Mediterranean cookery is offered in the restaurant and you can also experience an delicate aperitif in the vestibule lounge. The hotel is also near lots of famed streets and the commercial, financial area of the city. This the ideal spot for those who visit the city for enjoyment and for business themes. A room booking in Adler needs to be validated by one of the common credit cards (VISA, MasterCard, American Express, DinerClub, etc). OrangeSmile.com never charges guest's credit cards - this is a full prerogative of our hotels. hotel Adler reserves the rights to pre-authorise a credit card prior to your arrival. Reserve the right hotel in Madrid without any booking fees and using our last-minute discounts. OrangeSmile.com online booking system offers all kind of accommodation and lodging types in Madrid: single, double, triple rooms, apartments and suites - always with our best price guarantee. 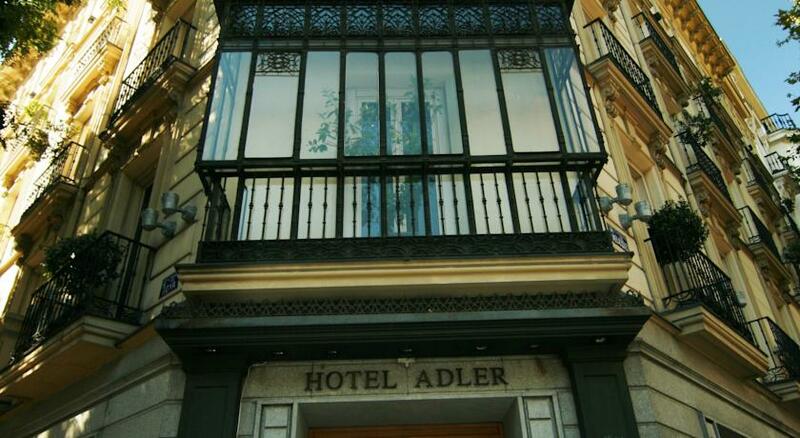 Use your travel budget efficiently - make your stay in hotel Adler cheap and comfortable.